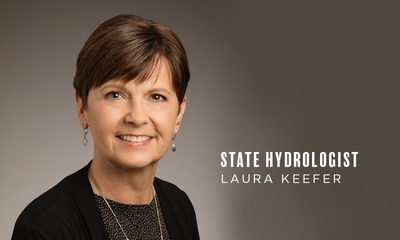 CHAMPAIGN, Ill., 6/19/18: Laura Keefer, head of the Watershed Science Section at the Illinois State Water Survey (ISWS), has been named Illinois State Hydrologist, one of seven state scientist positions enshrined in Illinois law and based at the University of Illinois’ Prairie Research Institute. In this role Keefer will provide science-based information and leverage the expertise of Water Survey staff on statewide water issues. As State Hydrologist, Keefer plans to monitor emerging water-related issues in Illinois and find opportunities in which there is a need for scientific information and data on watersheds, rivers, groundwater, and other state water resources. Her position will also involve answering inquiries from state agencies and municipalities. Most importantly, her role will be to represent the ISWS and tap into the expertise of scientists at ISWS. Two current water-related concerns in Illinois are having either too much water or not enough, Keefer said. In recent years, Illinois has experienced more frequent and extreme storm events that have caused more frequent flooding than in the past. Also, water supply planning requires constant effort but usually receives public attention only during extremely dry periods or droughts. Another important concern is sediment and nutrient loading in Illinois’ rivers. Keefer has more than 30 years of experience in multi-scale watershed monitoring studies of hydrology, sediment, and nutrients for many Illinois watersheds. Over the years, she has served as technical or science advisor, as well as ISWS representative, on dozens of committees ranging from watershed planning to state and federal interagency task forces to resolve hydrologic, sediment, and nutrient watershed concerns. Keefer joins State Climatologist Jim Angel, State Geologist Richard Berg, State Entomologist Christopher Dietrich, State Archaeologist Thomas Emerson, and State Pollution Prevention Scientist Nandakishore Rajagopalan.